You might be pleased to know my blog header's spur gears now properly mesh. Finally! 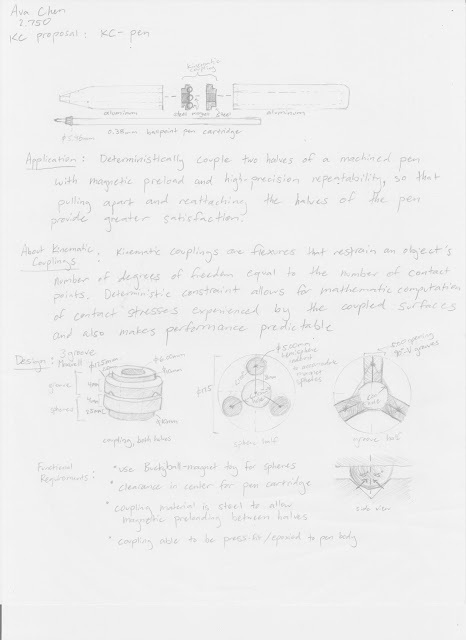 Our first lab in 2.750: Medical Device Design was a refresher in mechanical engineering fundamentals - designing, calculating, and validating measurements for a kinematic coupling. Kinematic couplings are really cool - a simple, deterministic way to prevent things from wobbling or be otherwise imprecise in all 6 DOF. One of the professors for the course is really into kinematic couplings, and so of course we the students needed to share in the joy by making some ourselves! I have to build more gift-pens anyway, so I thought it would be cool to magnetically connect the two halves via a kinematic coupling using buckyball-magnet-toys. More things I've been working on but hadn't gotten around to documenting: Ripstik is still under construction! Last time I had gotten to the test-riding phase of Ripstik build and had realized it was just too tall to be ride-able. 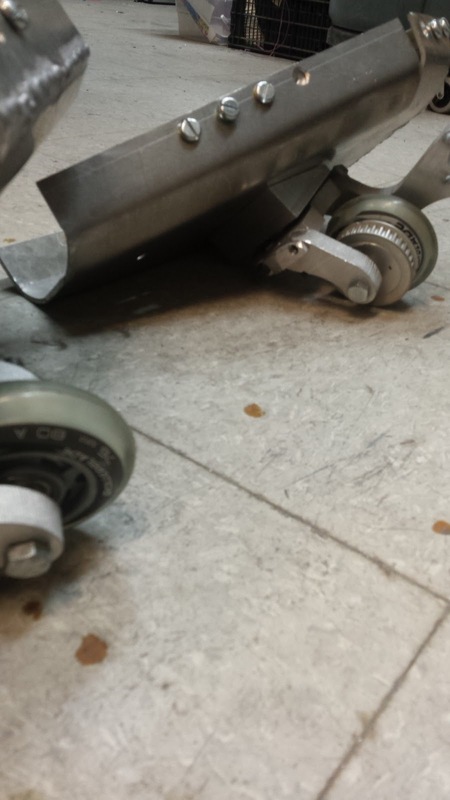 So began a long series of modifications to the casters. The original casters needed to became ~0.5" shorter, so I removed the intermediary sections of the caster. 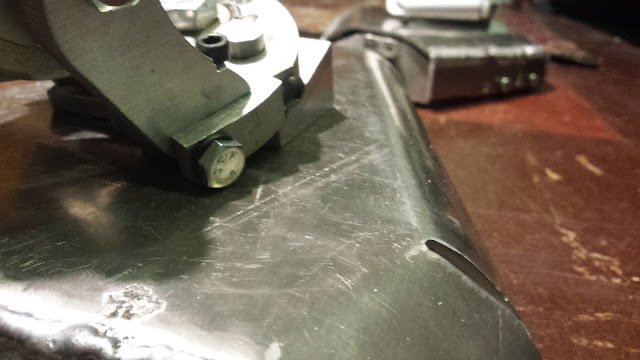 This, however, made the casters no longer clear the chassis when rotating further than 45deg. 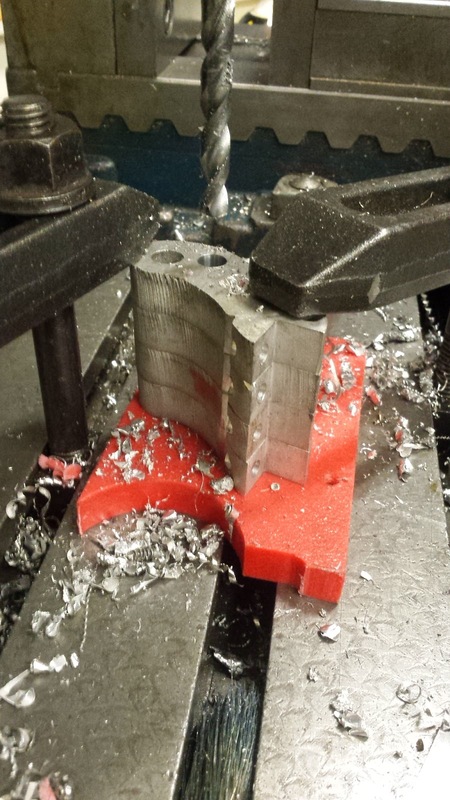 This was a problem solved by a combination of milling/sanding the aluminum wheel-arms slightly narrower and rounding-over the axle bolts. Similarly, the chassis also needed to become shorter, but the locations of the holes for the screwblocks force me to either cut very little or cut a lot. 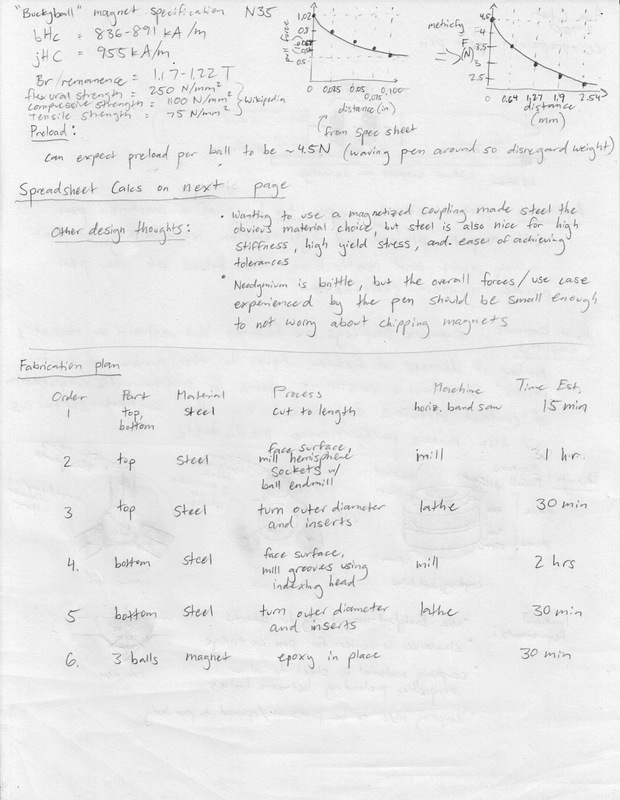 I'm still deciding whether I would have enough space for batteries if I shortened the chassis a full inch. 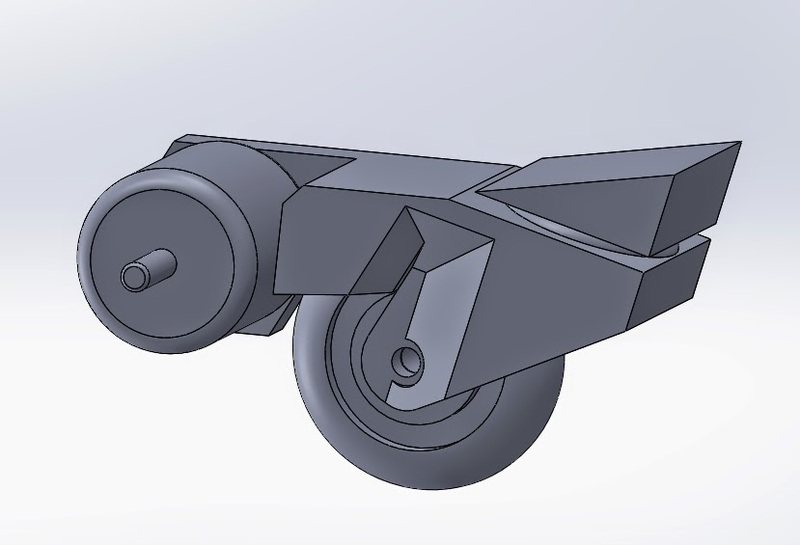 Finally on the mechanical side, because I shortened the casters, I ended up shifting the locations of the wheels farther back than originally planned. This made the sweeping motion awkward, so I had to drill adjusted axle holes. Finally, for 6.131 Power Electronics Lab, I started working on a prototype for a 3-phase sensored-brushless motor controller. By the end of the class, I had behaving hardware but not-quite-working software. 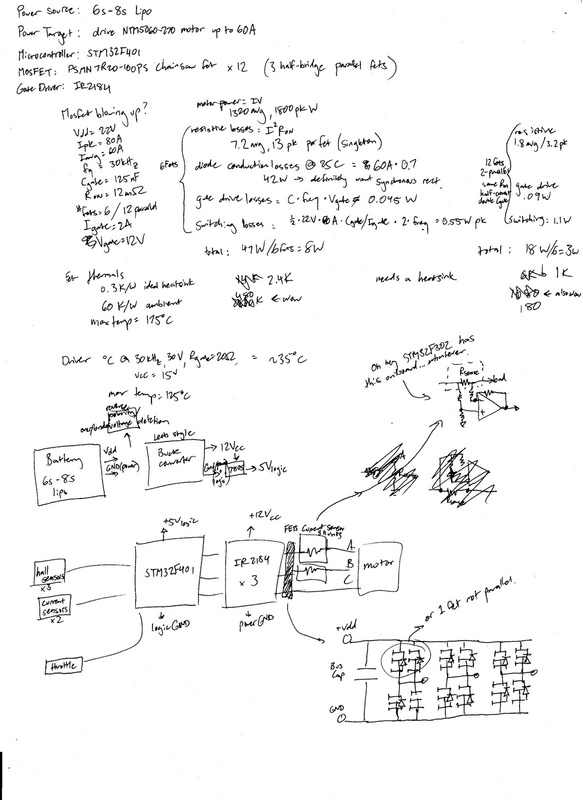 Above: brief calculations for creating specs and designing the motor controller. So - still working on it, promise! Hi! Sorry for the long hiatus. 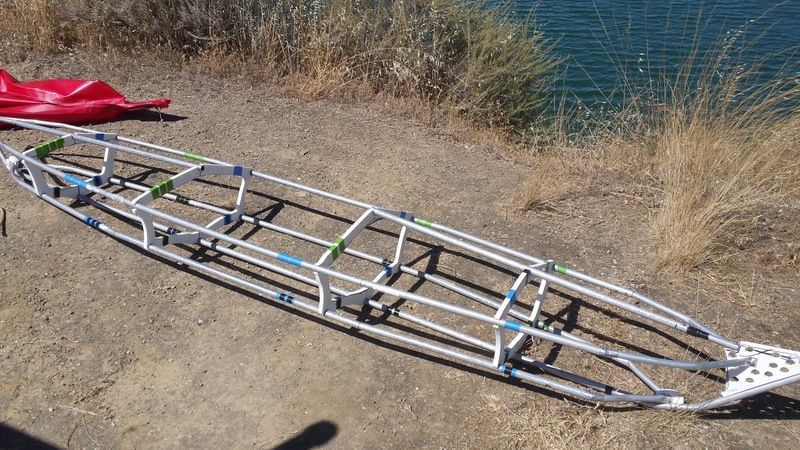 I built a kayak last spring and took it to California and back! This photo was taken in Steven's Creek Reservoir, just a little bit west of Cupertino. Here it is, partially loaded up for a day trip. My kayak seems to do best at a total load of 150-160lbs. I'm really pleased with how it turned out - after two excursions on the Charles River (Boston), it was successfully packed into a luggage and checked onto a plane to California where it has experienced two freshwater voyages and one saltwater trip. Now it's stowed in its carrying bag (a golf-bag dust cover!) back in Boston! The prompt for this project was a challenge from MIT's Chancellor to "make something creative that crosses the Charles" by May 7th, 2016. Students and MIT affiliates could apply for funding to make these projects happen, and also would be able to participate in the MIT Moving Day Parade! 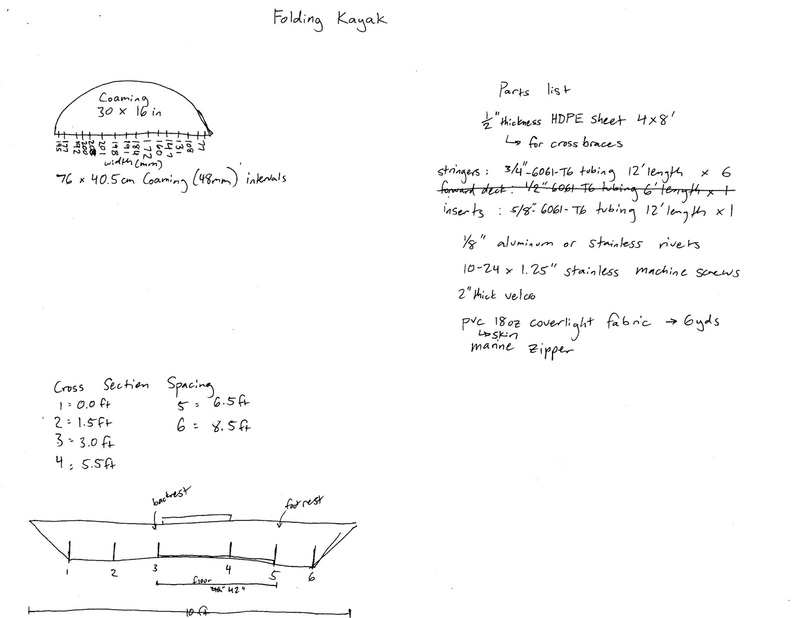 This year was the 100th anniversary of MIT moving from Boston to Cambridge, and MIT would pay me to make a fun kayak. Wooooo! 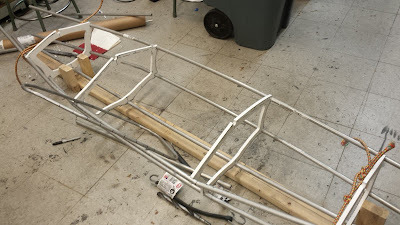 My kayak used skin-on-frame construction, where the crossbeams were made from HDPE connected with tent-pole style 6061 aluminum tubes. The skin was 18oz PVC fabric (normally used for ultralight planes) and the flooring was made from 6061- L brackets and 3/8" marine plywood. All screws used were stainless steel in order to mitigate saltwater rusting. Tom Yost has an excellent writeup for how to design and fabricate the components of a skin-on-frame kayak, so I won't go too much into detail here. 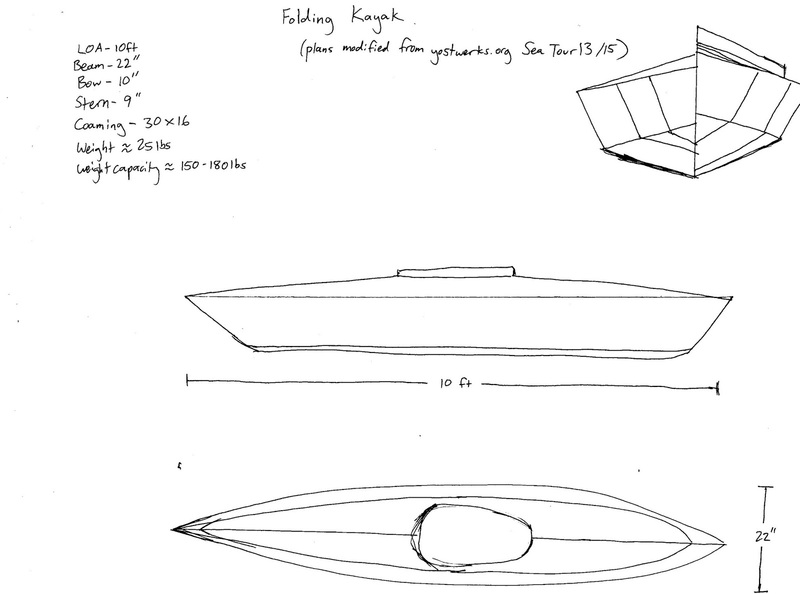 My modifications slightly widened out the profiles of each crosspiece to compensate for shortening length of the boat. 1. 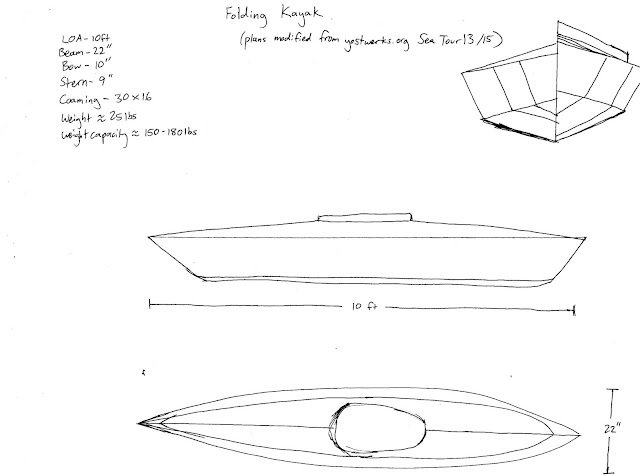 I don't know anything about boats. Time to learn everything about boats. 2. Tolerances are +/- 0.5" I have so much wiggle room. 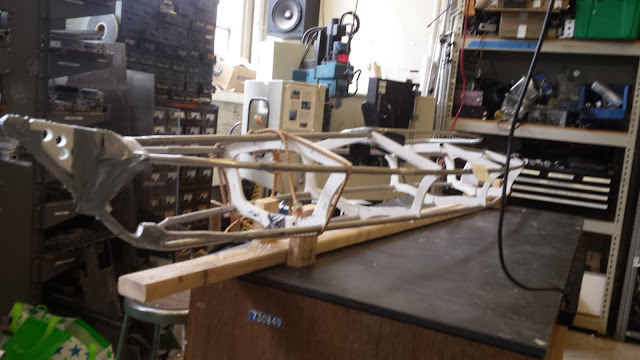 Frame building started with screwing the end crosspiece segment to a wooden frame called a strongback. The strongback helps maintain alignment and has marks denoting where the other segments should be positioned. It was also useful for determining whether the overall shape was symmetric or needed to be adjusted. 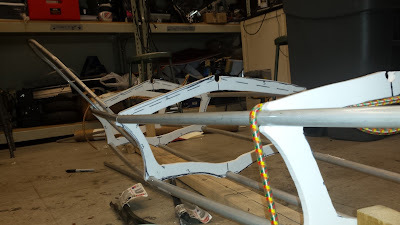 Assembly consisted of fitting tubes to crosspieces to test the snapfit, making adjustments, and using bungee cords to maintain compression while I moved on to the next segment. Eventually things stopped exploding without bungee persuasion, so I called it done. My kayak's maiden voyage was Crossing the Charles on Moving Day! The procession involved paddling from the MIT sailing pavilion to the Boston Esplanade, properly crossing back to the MIT side for the parade, then putzing around in the river with friends. In total, my time in the water was around 3-4 hours with no issues. I was pleasantly surprised to find out I didn't actually need to bring my bilge pump after all. As shown in the video, paddling this kayak produces a disproportionately large wake. 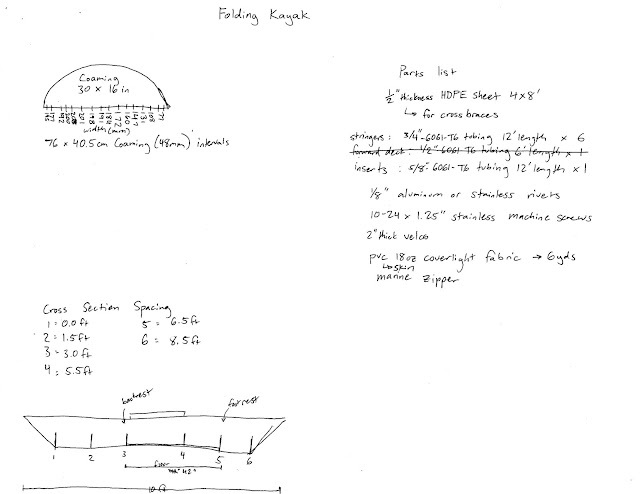 It's clear that my modifications negatively impacted hydrodynamics of the kayak profile. But, my kayak wasn't designed for speed. It works well enough to keep up with friends traveling at a light pace (3.5-4 mph) but I definitely wouldn't be able to race anyone. The real test of this kayak was packing it up, carrying it through the airport, and trying it out in California. By the end of the summer, I had managed to get assembly time down to 15-20min and disassembly down to 10min. 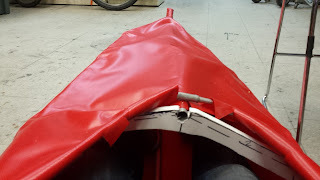 Sitting in the dirt trying to put the kayak together with just a hex key and a screwdriver was a valuable learning experience, because I quickly identified a bunch of ways I could've made the design better. I should have drilled screw holes using a drill press to ensure holes were perpendicular through the HDPE so screw direction wouldn't matter. Currently some holes require screws in a particular orientation, which adds to assembly time. It would've been nice to use two zippers on the PVC skin instead of just a bow zipper, because pulling the skin on like a sock is a tight fit. Different-colored masking tapes is not going to be a permanent solution to mark which poles belong where. Additionally, it turns out even stainless rusts after enough exposure to salt water. I will need to replace all my screws before taking the kayak out again in Boston. This ended up being a fantastic project that I'm still enjoying long after the construction. I'll end this post with some more photos from California.